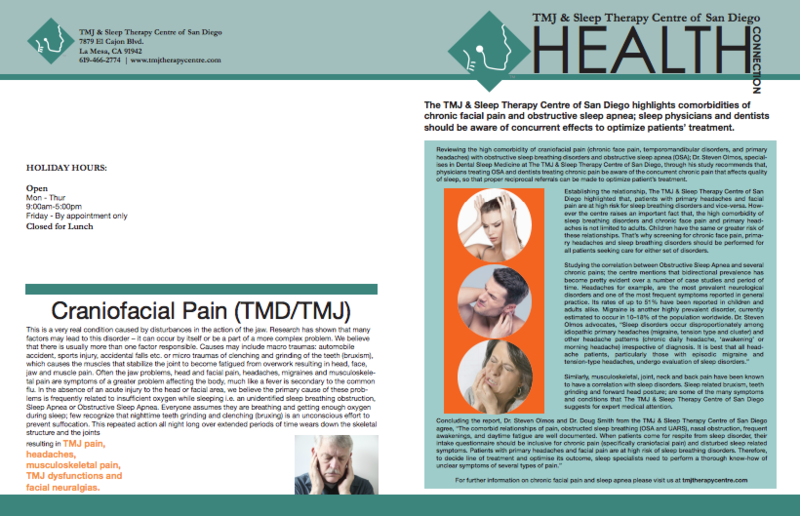 Home / News / The TMJ & Sleep Therapy Centre of San Diego highlights comorbidities of chronic facial pain and obstructive sleep apnea; sleep physicians and dentists should be aware of concurrent effects to optimize patients’ treatment. The TMJ & Sleep Therapy Centre of San Diego highlights comorbidities of chronic facial pain and obstructive sleep apnea; sleep physicians and dentists should be aware of concurrent effects to optimize patients’ treatment. Reviewing the high comorbidity of craniofacial pain (chronic face pain, temporomandibular disorders, and primary headaches) with obstructive sleep breathing disorders and obstructive sleep apnea (OSA); Dr. Steven Olmos, special-ises in Dental Sleep Medicine at The TMJ & Sleep Therapy Centre of San Diego, through his study recommends that, physicians treating OSA and dentists treating chronic pain be aware of the concurrent chronic pain that affects quality of sleep, so that proper reciprocal referrals can be made to optimize patient’s treatment.